Never Die Alone is a 2014 crime drama from director Ernest R. Dickerson. The film is based on the late author, Donald Goines' 1974 novel of the same name. 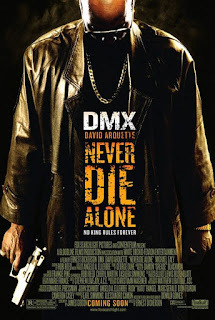 Starring rapper DMX, Never Die Alone the film focuses on a drug kingpin whose return home touches off a turf war. After a small-time drug kingpin known as King David (DMX) is murdered, Paul (David Arquette), a young white reporter who witnessed the murder and brought King David to the hospital where he died, decides to investigate the circumstances leading up to King’s death. Paul wants to use that as research for a investigative report that he hopes will get him a newspaper job, but David’s death also sets off a small, but very violent turf war. As Paul listens to King David’s audiotape journal (heard as a voice-over narration that frames the film) which depicts King David’s rise, his hopes for the future and for redemption, and (unbeknownst to him) the final hour of his life, people are dying in an ever increasingly violent conflict. Directed by Ernest Dickerson, Never Die Alone is a gritty, vulgar, violent, entertaining, and ultimately quite poignant crime drama. Sadly, the film had a somewhat limited theatrical release and the studio never really gave it a chance to catch on; hopefully, many viewers will discover it on home video. Two things work against Never Die Alone being a great film. The first is that the film is really three movies. The first half hour or so is a tension filled street-crime drama with wonderfully intriguing characters who have the all-important element that really sells a story – motivation. The second film is a flashback of King David’s life, as narrated by his audio journal. The third is Arquette’s Paul character prowling the streets where King David was murdered in an attempt to feel the gangsta life. On the surface, any of these three would make a good movie if the filmmakers focused on one and fully developed it, especially the first sequence and incidents surrounding King’s death. Actually, the separation from David’s return and death to move to another story line is quite jarring and, for all its interesting moments afterwards, the film never really recovers from that. The second thing that really works against the film is DMX’s narration. It is acceptable that he isn’t a great actor, but the thing for a director to do is to not lean on him so much. He’s credible as a hood-type, and he can certainly get better over time with more experience as an actor and maybe some acting lessons (like that’s gonna happen). But the worst thing to give an inexperienced actor is extensive narration duties in a film. Simply put, the syncopation and rhythm that made DMX such an admired rapper is missing in his narration for Never Die Alone. That’s bad for this film because so much of King David’s character and about his motivation is told rather than shown. Sometimes, what DMX is saying comes across as stiff, but to be fair, there are times when he really sells a scene and King David with inspired moments of pure passion. Warts aside, DMX and David Arquette do fairly good jobs as this film’s stars, but there are some good supporting performances; the best of the lot is Michael Ealy. Excellent in the Barbershop films, he should have acting jobs pouring in, and we should see him more. Just as talented as a slew of young stars like Orlando Bloom, Ashton Kutcher, and Heath Ledger, I wonder why we don’t see Ealy more.